Like so many other life issues, I filter my attitude about paying taxes through my worldview – which includes my faith. It may surprise you to know the Bible does speak about taxes and encourages a specific response to those who claim to be followers of Jesus. It’s interesting to note in this passage why Jesus chose to pay the temple tax. As a spiritual teacher he should have been exempt. However, the religious leaders of his day did not recognize his authority as a spiritual teacher of the people. So even though he didn’t have to pay his tax Jesus chose to so as not to offend them. Jesus was concerned how the people viewed him. As a follower of his that’s something I should be concerned about as well. In being so I pay taxes for the sake of my personal testimony of faith. This was truly a dicey situation. If Jesus responds by saying “No” the Pharisees can have him arrested for speaking out against Rome. If he says “Yes” they believe he will be rejected as the Messiah by the Jewish people who were none to fond of Rome. Jesus has really been put in a situation where the religious leaders think there is no escape. “…Show me the tax money.’ So they brought Him a denarius. Based on these two accounts it’s evident Jesus taught his followers in words and in deeds to pay the taxes that were due the government. It was not something to intentionally avoid. “…Therefore you must be subject, not only because of wrath but also for conscience’ sake. “For because of this you also pay taxes, for they are God’s ministers attending continually to this very thing. In this passage Paul is not advocating that believers should obey every law. Clearly a government could pass laws that are in conflict with a Christian worldview. However, as much as possible we are to respect and comply with those laws where we can. And as you can see from the text, one of the situations he cites relates to the paying of taxes. We all have “but what about…?” scenarios where we think that it’s wrong to pay taxes for some reason. I live with a CPA so I know how tricky these situations can get. I don’t see any teaching from the Bible that says we can avoid taxes altogether. Put the above verses together and it seems clear we have an obligation to pay taxes based on the authority vested in governments to institute applicable tax laws. However, there are no instructions about the morality of reducing one’s tax burden. As long as an individual is working within the framework of applicable tax law, they would not be violating Scripture to lessen the amount of taxes they pay. But therein lies the rub for most people. “What’s legal?” and “What can I get away with?” are the two questions we ask at tax time. Those are the wrong questions to ask when making a decision. Those questions allow us to walk right up to the edge of indiscretion into some very gray areas. In many cases, we’ll cross the line if there is little chance of us getting caught (i.e. not reporting cash revenue from work). Those strategies may save you money but they won’t leave you with a clean conscience. You’ll clearly have to think through your own tax paying strategy. From my standpoint as a follower of Jesus, it’s a matter of personal testimony and obedience. Yes, I don’t care to pay so much in taxes but the potential consequences – both spiritual and personal – are far worse. Questions: What do you think about these Biblical teachings on taxes? Do you think it’s OK to reduce your tax burden by legal means? Do you think governments have gone overboard in taxing people? What can we do about taxes if we don’t like what our government representatives are passing into law? Prior Post: What Do I Need to Know About Homeowner’s Insurance? When I reread the Matthew 22 passage several years ago it changed my attitude entirely. On reading your post today I am wondering if this submission to human authorities is actually showing our submission to God and consequently is an important part of God shaping us. As a former IRS employee (please don’t hate me) I can safely say there is a huge difference between tax avoidance and tax evasion. 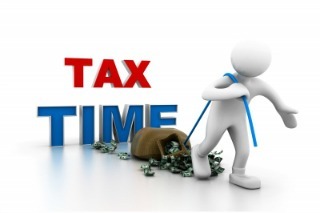 Tax avoidance is the manner in which you legally structure your finances to minimize taxes. Deferring income and taking legal deductions are examples. Tax evasion is entirely different in that it is the illegal hiding of income or taking fraudulent deductions to which you are not entitled. No one is required to pay more taxes than they legally owe, regardless of what Warren Buffet says. And I don’t believe that structuring your finances to pay less legally is a sin. “…pay more taxes than they legally owe, regardless of what Warren Buffet says.” Haha…that’s a great line Kathy. And you hit on a really important point about the difference between evasion and avoidance. I don’t see any reason to be critical of those who avoid taxes within the framework of the law. The challenge with the law though (according to my wife who is a CPA) is knowing exactly what it says. Sometimes two people can see some of the statutes in entirely different ways.